Learn how to play 8 ball pool like a pro! This article will teach you the basic fundamentals and give you a few key pointers while you’re at it. 8-Ball pool is the most popular pool game, boasting more than 30 million American 8 Ball players across the globe! Eight-ball pool is commonly referred to as highs and lows, solids and stripes, or spots and stripes. Being that it’s so popular (you guessed it), it’s one of the easiest games to learn how to play. Choose whether you want to take solids or stripes. First person to pocket the 8-Ball last is the victor. If you scratch, you lose your turn. If you pocket a ball and scratch on the opening break, the pocketed ball is placed back on the table and you lose you turn as well. Anytime you scratch, the opponent receives ball-in-hand. Below are the 8-Ball rules from the Official BCA handbook. Game Tables Online is proud to host A Pool Odyssey, a billiards instructional series by BCA Master Instructor Mark Finkelstein. Click below to learn from an official BCA Instructor. 8-Ball is a call shot game played with a cue ball and fifteen object balls numbered 1 through 15. Each player or team has a group of seven balls: the solid colored balls numbered 1 through 7, or the striped balls numbered 9 through 15. The 8-ball is the game winning ball. The object of the game is for you to pocket your entire group of balls and then legally pocket the 8-ball. The game is played by two players or two teams. D. the remaining balls are placed at random, except that the ball at each rear corner of the rack must be of a different group from the other rear corner (left/right orientation those two balls does not matter). 1. You begin the break with ball in hand behind the head string. The break is not a called shot, and you may not call a ball or a safety on the break. There is no requirement for the cue ball to contact any particular ball first. You must legally pocket a ball or cause at least four object balls to contact one or more cushions or it is an illegal break. If you legally pocket a ball, you continue to shoot. If you do not legally pocket a ball or you commit a foul, your inning ends. 2. If you intend to break softly, you must notify your opponent and allow them the opportunity to call a referee to watch your break. . If you fail to notify your opponent you will receive a mandatory warning on the first offense. Second and subsequent offenses are fouls. b. require you to re-rack the balls and break again; The game cannot continue until there is a legal break. If the break is illegal and there is also a foul on the illegal break, the illegal break takes precedence and you must choose either option (a) or (b) above. 4. If you foul on a legal break and do not pocket the 8-ball, your inning ends and any other pocketed object balls remain pocketed. Your opponent receives ball in hand. 5. 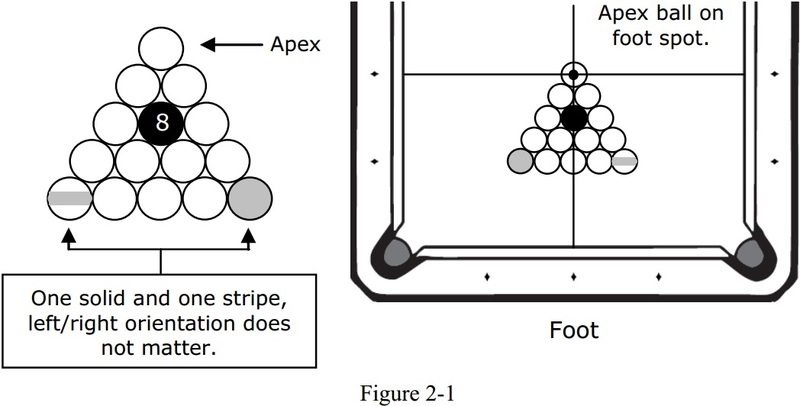 In all cases on the break, jumped object balls other than the 8-ball are not returned to the table except in the case of a re-rack. If the 8-ball is jumped it is spotted. B. re-rack the balls and break again. B. re-rack the balls and break. 3. If the 8-ball is pocketed on the break, and it is not noticed until after another shot has been taken, the game will be replayed with the player who broke the game breaking again. 1. 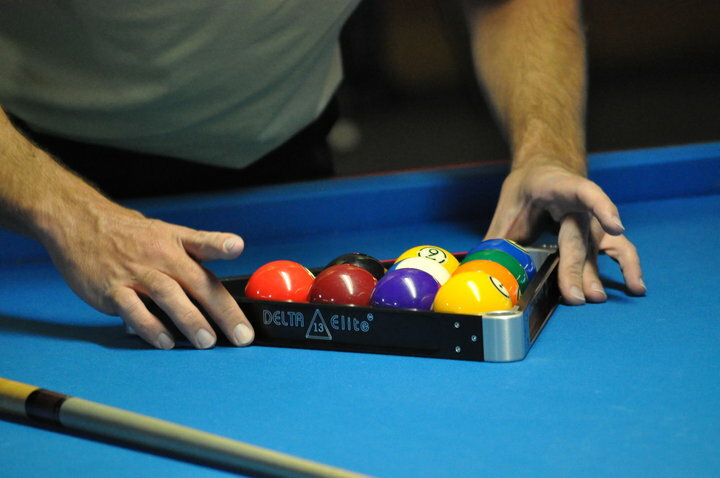 Groups are established when the first object ball is legally pocketed on a shot after the break. The player legally pocketing the first ball is assigned that group, and the opponent is assigned the other group. You cannot establish a group on a safety. 2. If all balls of either group are pocketed on the break or illegally pocketed before groups are established, either player may legally shoot the 8-ball during their inning. You win the game if you legally pocket the 8-ball on such a shot. 3. Once they are established, groups can never change for the remainder of that game. If a player shoots the wrong group and no foul is called before the next shot and the player continues to shoot at that group, or if at any time during the game it is discovered by either player or a referee that the players are shooting the wrong groups, the game will be replayed with the player who broke the game breaking again. 1. Once groups are established, play continues with each player having their group as legal object balls. Balls in your opponents’ group and the 8-ball are illegal object balls. When it is your inning, you continue to shoot as long as you legally pocket a ball on each shot. Object balls pocketed in addition to the called ball remain pocketed. Your inning ends if you do not legally pocket a ball. 2. Jumped object balls and illegally pocketed balls are not returned to the table but do count in favor of the player with that group. Rule 2.8 has been re-written with the procedures for calling a safety removed. The procedures for calling a safety and the players’ responsibilities concerning calling a safety have been modified and moved to Rule 1.17 and Rule 1.42. Prior to any shot except the break, you may declare a safety. On a safety, your inning ends after the shot regardless of whether you pocket any ball. If you do not declare a safety and you pocket a ball on an obvious shot, your inning continues and you must shoot again. A safety must meet the requirements of Rule 1.19, Legal Shot, or it is a foul. 1. The 8-ball becomes your legal object ball on your first shot after there are no balls of your group on the table. The player who legally pockets the 8-ball wins the game. 2. With the exception of the provisions of Rule 2.10, it is not loss of game if you foul when shooting the 8-ball but do not pocket the 8-ball. Your opponent receives ball in hand. F. you commit a foul under Rule 1-33-4 or 1-33-7 and the 8-ball falls into a pocket. The Klondike Log Pool Table is perfect for rustic game room decor. $3,450.00. Game Tables Online.com carries a sells pool tables online. We carry some of the best tables at the lowest prices on the internet. Click here to check out the latest pool tables!